This article is part of a series of blog posts dedicated to the best .NET e-commerce platforms out there: nopCommerce, Virto Commerce, DNN, Umbraco, Kentico, Sitecore, and Sitefinity. So far, we have discussed nopCommerce and what it can offer in terms of features, themes, and plugins. We also discussed the platform’s architecture, ecosystem, and support plans. Click here to read the whole article. In this blog post we will discuss Virto Commerce. 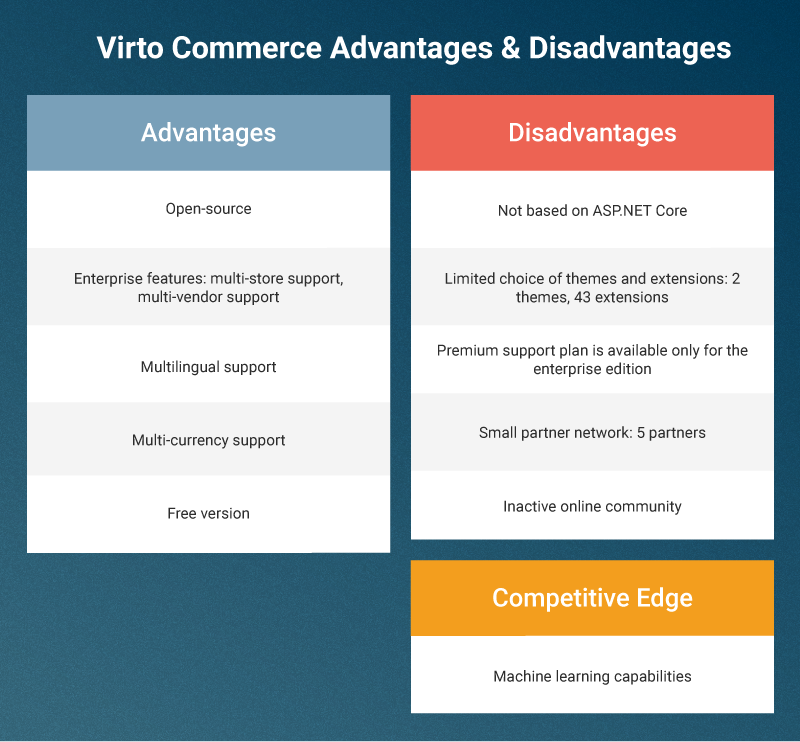 Virto Commerce was developed by a team of distributed developers most of whom have previously worked on the development of the MediaChase E-commerce Framework (ECF) - an online tool for e-commerce solution development that is currently known as Episerver Commerce (it was acquired by Episerver in March 2012). Note that the development of ECF started way back in 1997. So, by 2013 which is when the first version of Virto Commerce was released, the team that developed the platform, had 16 years of experience in developing e-commerce solutions. Modular enterprise .NET e-commerce platform architecture. Virto Commerce is built on top of previous version of the .NET platform, namely .NET 4.6. Virto Commerce Manager is at the core of Virto Commerce and provides administration and management tools. Virto Commerce core functionality can be extended with modules and capabilities. Virto Commerce can be integrated with back-end ERP systems and front-end authentication solutions. Multi tenant/vendor support. You can control vendor permissions, customize each vendor’s storefront, etc. Product Information Management (PIM). You can manage digital, physical and subscription-based products. You can also integrate your store with third-party PIM solutions. Advanced Catalog Management. You can manage complex B2B and B2C product lists, multi store catalogs, no-database catalogs, virtual catalogs, and more. Machine learning based product recommendations. Promotions engine. You can create promotional banners, products promotions, shipping promotions, marketing campaigns, etc. You can also offer discounts, coupons, and more. Content Management System (CMS). Simple CMS features come out-of-the-box. You can easily create blog posts, banners and landing pages, for example. However, if you need more flexibility, you can integrate your store with leading content management systems like WordPress, Orchard CMS, and Umbraco. Responsive pricing engine. You can personalize prices based on audience, purchase history, location, and more. Tier pricing and custom currencies (such as bitcoin) are also supported. Distributed order management software. You can integrate your store with IMS, ERP and leading accounting systems. Thus, you can easily track and manage orders (including split and recurring orders) and order statuses. You can also sync all data to inventory logs, process invoices and payments, and more. Note: Anonymous checkout and one-step checkout are not available out-of-the-box. If you want to enable anonymous checkout, you can download a Shopping Cart Module from the Virto Commerce Marketplace. If you want to add a one-page checkout feature to your online store, you will need a certified .NET developer. There are 5 themes listed in the Virto Commerce Marketplace. Currently, only two 2 of the 5 themes are available - Default theme & Material theme. The other three themes are still in development. All 5 themes are free and developed by Virto Commerce. Compared to NopCommerce, Virto Commerce obviously offers significantly smaller number of themes. In addition, none of the themes that Virto Commerce offers sport advanced functionalities. There are 43 extensions in the Virto Commerce marketplace: payment gateways and modules related to content management, customer management, indexed search API, inventory, shopping cart, pricing, and more. You can also find integrations with third-party software such as Google Analytics, MailChimp, Marketo, etc. The extensions are not organized into categories and subcategories. Therefore, you will not be able to filter them, i.e. you will need to go through all plugins in order to find the one you need. Aside from the ‘Themes’ and ‘Extensions’ categories, the Virto Commerce marketplace has a ‘Solutions’ category as well. It consists of 3 products: a collection of sample e-commerce websites, a corporate rewards program, and a dynamic product configuration and pricing engine. Virto Commerce have listed only 5 official partners on their website. The company doesn't have a forum. In addition, they haven’t been very active on social media - at the time of this writing, their last Facebook post was published on February 28, 2018 and their last tweet is from May 8th, 2018. However, if you need help, you can check their knowledge base and access their latest documentation. We hope this blog post helped you get a better idea of what Virto Commerce can offer you. Stay tuned for the next article from the series of blog posts dedicated to the best .NET e-commerce platforms - DNN.